Brooklyn barbecue by way of Austin, Texas. : Set in Red Hook, Brooklyn, Hometown Bar-B-Que is a trek if you don't live in the neighborhood, but it's well worth it. 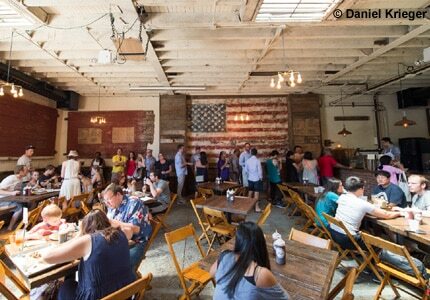 The big industrial interior is a fitting setting for this beast of a barbecue joint. The man in the pit is Brooklyn native Bill Durney, who quit his job and went off to study under legendary Austin pit master Wayne Mueller. It paid off. Hometown Bar-B-Que is among the best of the New York City barbecue spots. Meat is expertly done: beef rib is a tender specimen, the cracked peppercorn exterior adding extra flavor. 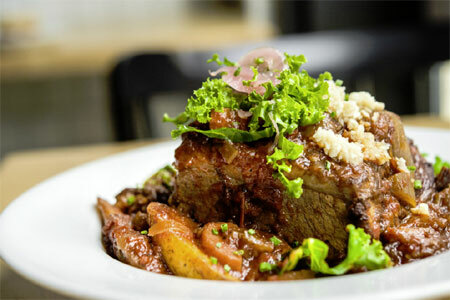 Follow it up with the ultra-tasty brisket or the lamb belly. And why not throw in a pork sausage? Its casing snaps with each bite. Sides include sweet baked beans and Texas-style queso mac 'n' cheese, among others. Banana cream pudding is the lone dessert. There's a full bar and a handful of nicely selected beers on tap.